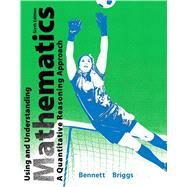 by Bennett, Jeffrey O.; Briggs, William L.
Improved results with MyMathLab ® , which is designed to work hand-in-hand with the book and offers additional practice and learning aids that improve student learning in measurable ways. The real-world focus turns students’ attention to the math they will need for college, career, and life. A wide range of exercises and problem types end each unit, making it easy for instructors to create assignments to fit their course goals. Study and review features in every chapter are designed to help students use their time effectively. Jeffrey Bennett specializes in mathematics and science education. He has taught at every level from pre-school through graduate school, including more than 50 college courses in mathematics, physics, astronomy, and education. His work on Using and Understanding Mathematics began in 1987, when he helped create a new mathematics course for the University of Colorado’s core curriculum. Variations on this course, with its quantitative reasoning approach, are now taught at hundreds of colleges nationwide. In addition to his work in mathematics, Dr. Bennett (whose PhD is in astrophysics) has written leading college-level textbooks in astronomy, statistics, and the new science of astrobiology, as well as books for the general public. He also proposed and developed both the Colorado Scale Model Solar System on the University of Colorado at Boulder campus and the Voyage Scale Model Solar System, a permanent, outdoor exhibit on the National Mall in Washington, DC. He has recently begun writing science books for children, including the award-winning Max Goes to the Moon and Max Goes to Mars. When not working, he enjoys swimming as well as hiking the trails of Boulder, Colorado with his family. William L. Briggs has been on the mathematics faculty at the University of Colorado at Denver for 22 years. He teaches numerous courses within the undergraduate and graduate curriculum, and has special interest in teaching calculus, differential equations, and mathematical modeling. He developed the quantitative reasoning course for liberal arts students at University of Colorado at Denver supported by his textbook Using and Understanding Mathematics. He has written two other tutorial monographs, The Multigrid Tutorial and The DFT: An Owner's Manual for the Discrete Fourier Transform, as well as Ants, Bikes, Clocks, a mathematical problem-solving text for undergraduates. He is a University of Colorado President's Teaching Scholar, an Outstanding Teacher awardee of the Rocky Mountain Section of the MAA, and the recipient of a Fulbright Fellowship to Ireland. Bill lives with his wife, Julie, and their Gordon setter, Seamus, in Boulder, Colorado. He loves to bake bread, run trails, and rock climb in the mountains near his home. 5B Should You Believe a Statistical Study? 12A Voting: Does the Majority Always Rule?